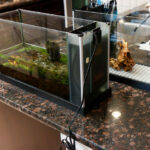 One challenge in planning for a new planted aquarium is determining how much substrate you need for the depth you want. At the same time, it becomes challenging to compare various brands of substrate (that all come packaged with different volumes of product in each bag) and plan for the number of bags that your setup will require and the resulting cost. Below is my Aquarium Substrate Calculator. 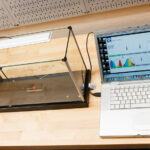 You can enter the dimensions of your aquarium and the desired depth of substrate, and it will calculate the volume of substrate you will need. I have made things uniform by making all volume calculations in Liters. One thing to note is the first user input to select a preference for inches or centimeters. Select from the list of substrates and it will tell you how many bags you need to purchase and the estimated total cost (in US dollars). You can modify the fields for ‘Liters per Bag’ and ‘Cost per Bag’ after they are populated if you have an updated price or product. Concerning the desired depth, it can vary from 1 to 4 inches (2.5 to 10 cm) depending on the scale of the aquarium and the needs of the plants. If you are planning on a large slope of substrate, you will have to visualize where the midpoint of this slope will be and make that point an estimated depth. 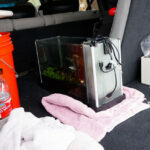 I have a depth of around 2 inches (5.1 cm) in our Fluval Spec V Aquarium. The values for volume per bag and cost per bag in this substrate calculator are based on my research and, in the case of Up Aqua Aquasand, from a bag that I purchased for our tank. Below the calculator I have more information on the substrates I have included in this calculator. Cost can vary greatly, especially when considering shipping for multiple bags of substrate. Feel free to check on the cost for the number of bags and update the fields for a more accurate total. ADA Aqua Soil Amazonia – This has long been the standard for planted aquariums. It comes advertised by volume, in this case it contains 9 liters of substrate in each bag. Shipping costs through Amazon vary based on the number of bags. The total cost I have listed per bag includes what I consider an average shipping cost. 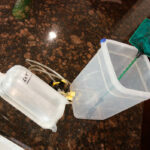 Up Aqua AquaSand – This is the substrate that I chose for the recent rescape of our aquarium. It is sold in 5 kg bags. I measured the volume as 4.4 liters. It is currently available on amazon and shipping is free. Seachem Flourite Black – This substate is what I initially had in our nano aquarium. It is sold in a 7 kg back. The Seachem webiste puts this bag at 5.3 Liters. CaribSea Eco-Complete – This is similar to fluorite. It is sold in a 20 lb (9.1 kg) bag. 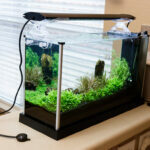 Eco Complete is sold with some water already in it that supposedly helps to cycle your aquarium. This water throws off the conversion from mass to volume a bit, but I estimate each bag has 5.9 Liters. The good news for people setting up a Spec Aquarium, whether it is the smaller III or the larger V, one bag of whatever substrate you choose will probably be enough. This entry was posted in Planted Aquariums and tagged ada aquasoil amazonia, eco complete, flourite, up aqua aquasand. Bookmark the permalink. Thanks very helpful ,i have a 48″x20″ aquarium and want to plant up ,im not sure of the best substrate to use for the planting to be as good as hope it will be.There seems to be so much advice im not sure who to turn to!! I Live in Brighton on the South Coast of England and have to travel far and wide for fish, good plants and looks like substrate from Amazon and good advice from the USA. Best of luck to ya! I wish I could offer better advice for products over the pond. I had a lot of trouble figuring out if my substrate choice would fill the bottom of my Fluval Spec III. I used your calculator and I still wasn’t one hundred percent positive. So just to put anyone’s mind at ease who might be wondering, a five pound bag of the popular Caribsea Super Naturals Tahitian Moon Sand will fill a Spec III nicely. Mine has a nice slope of 1.5 inches in the front to just over two in the back. I worried I might have ordered too little and then found a tank set up video on YouTube where the guy used only about 3 pounds of a different Super Naturals and his fill was really deep so I thought yeah I’m safe. When the sand came in I was surprised because it too every bit of it, but it was just right. Thank you for putting together this wonderful resource Nate. It’s so helpful, and so fun to watch your own experiments and tank exploits. Thanks so much for sharing with us all.